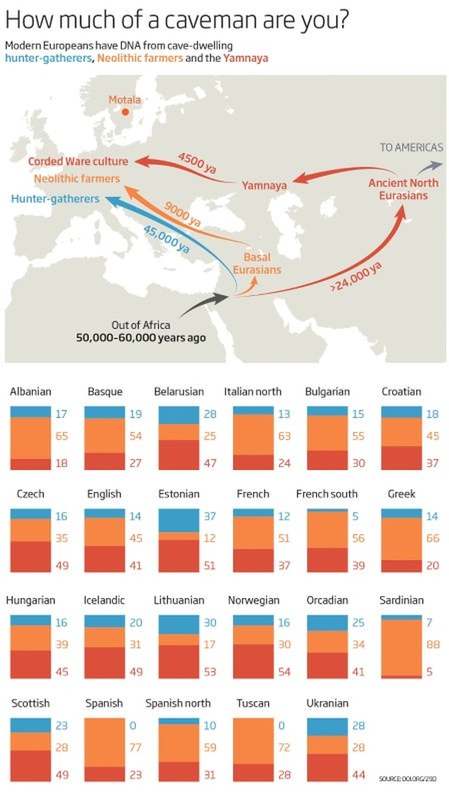 Comparing sets of genetic data, scientist have found that the DNA of people with deep European roots is a mix of three ancient populations: hunter-gatherers who arrived around 45,000 years ago, Neolithic farmers who arrived 9000 years ago, and pastoralists from the Eurasian steppes who swept across Europe on horseback and in wagons some 4500 years ago. Are you a European national? Find out how much of your DNA comes from these three groups.